Benjamin Smith Barton was born on February 10, 1766, in Lancaster, Pennsylvania. He was the son of Reverend Thomas Barton, a native of Monaghan County, Ireland, who came to America in 1750, and Esther Rittenhouse, sister of the celebrated American astronomer David Rittenhouse. Barton spent his childhood on Conestoga Creek near Carlisle, where his father, an Anglican priest, ministered to the Native Americans. Barton began the study of medicine under Dr. William Shippen, Jr. in 1784, soon after his eighteenth birthday. In 1786, he left for Scotland to continue his studies at Edinburgh University. Able, ambitious, industrious, and not without charm, Barton was quickly accepted by all groups of students in the university town. He became a member of the Royal Medical Society, received its Harveian Prize for his dissertation on hyosciamus niger (or black henbane), and was chosen one of the Society’s four annual presidents for 1787-1788. In 1787, while still a medical student, he published a monograph entitled Observations on some Parts of Natural History, which discussed the Indian mounds of North America. Despite his success at Edinburgh, Barton suddenly left the university in the winter of 1788 prior to receiving his M.D. A likely explanation for his departure is found in two 1791 letters addressed to Benjamin Rush, which state that, while its president, Barton borrowed a considerable sum of money from the Royal Medical Society but failed to pay it back. Though the Society did not advertise Barton’s mishandling of its funds, word of his behavior must have spread to student circles in Edinburgh, prompting his immediate departure. While it has been claimed that Barton took his M.D. at the University of Göttingen, he admitted on his return to Philadelphia in the fall of 1789 that he was never granted a degree of doctor of medicine by any university. His hopes of receiving the degree from the University of Pennsylvania’s Medical Department were cut short by his election as professor of natural history and botany in the Medical Department. Soon thereafter, he successfully entered into medical practice. Barton was finally awarded an honorary degree of doctor of medicine by Christian-Albrechts University at Kiel in 1796. Also in that year, he became professor of materia medica at the University of Pennsylvania. In 1798, he succeeded Dr. Rush as professor of the theory and practice of medicine and became a physician at Pennsylvania Hospital. Barton was vice president of the American Philosophical Society from 1802 to 1816. He was one of the Society’s most active members, winning its Magellanic Premium in 1804. He was also the founder and first president of the Philadelphia Linnean Society, and a member of the Linnean Society of London, the American Academy of Arts and Sciences, the Massachusetts Historical Society, and the Royal Academy of Science of Sweden. 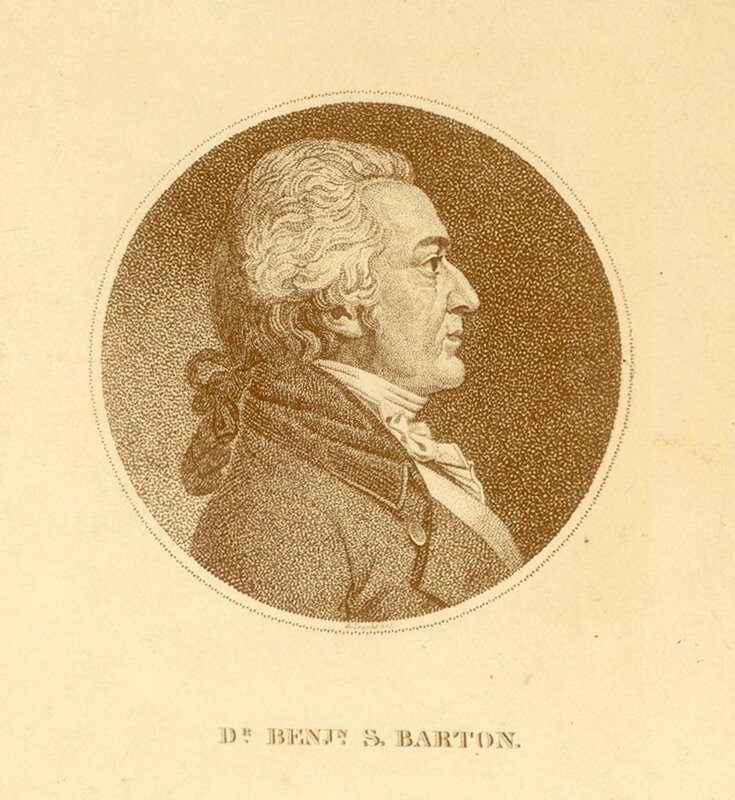 In 1809, Barton was elected president of the Philadelphia Medical Society, a position he held until his death. 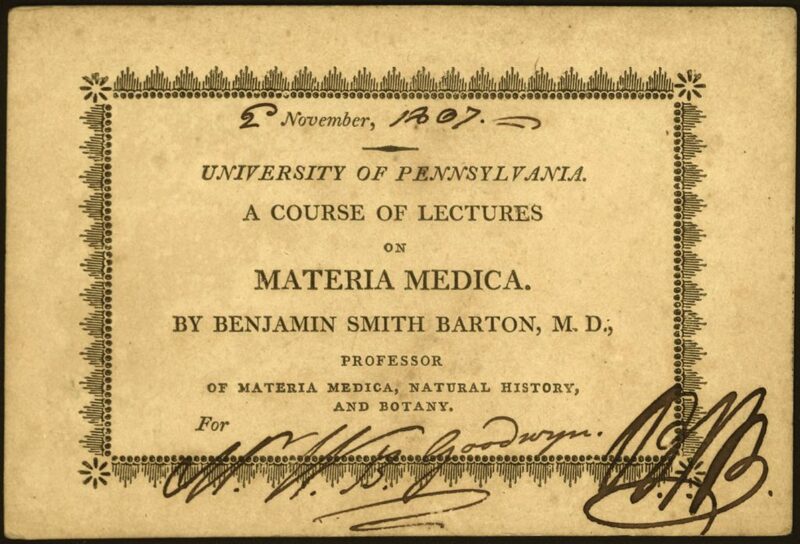 Barton wrote a score of books and monographs on natural history, botany, paleontology, etymology, and medicine. He conducted the Medical Physical Journal for several years and was the author of Elements of Botany, published in 1804, and of Collections towards a Materia Medica of the United States. His other publications include various papers in Philosophical Transactions and the first American text on botany. Barton was also an advisor to the Lewis and Clark expedition and a pioneer in exploring the botanical treasures of the western continent. He was the first to erect a greenhouse in Philadelphia, which was attached to his residence on Chestnut Street, below Eighth Street. Barton died on December 19, 1815. He left behind his two children: Sarah Barton, who died unmarried in 1817, and Thomas Pennant Barton, Secretary of Legation to France from 1833 to 1835, who married Coralie, daughter of the Hon. 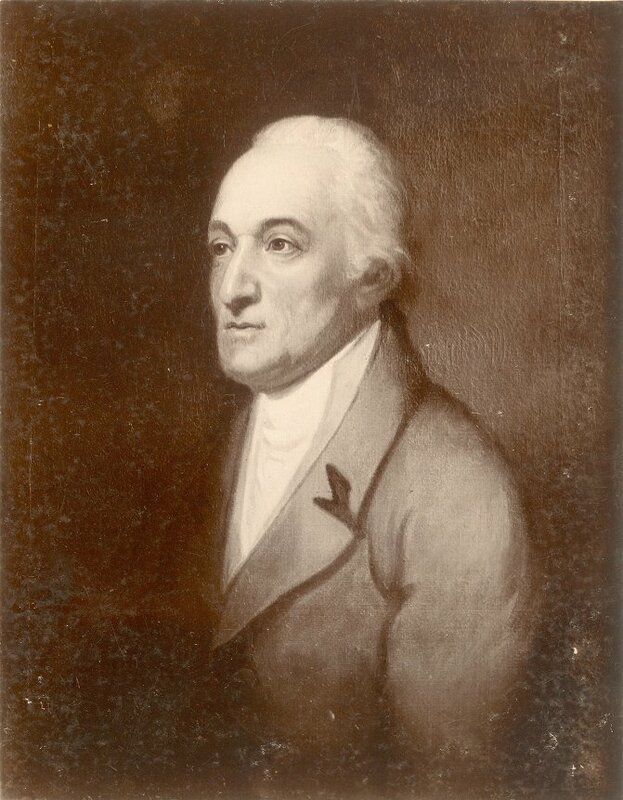 Edward Livingston, Secretary of State.